King's-Edgehill School | Our New Elite Girls’ Prep Basketball Programme! It is an exciting time around campus and especially around the Ted Canavan Athletic Centre, as our new Prep Girls Basketball Programme has been established at KES. The group of girls, pulled together via recruiting over the summer months, includes some of the best players in Nova Scotia. The “Basketball Girls” (as they are known on campus by students and staff) is a wonderful group of Grade 11 and 12 students, who have already made their mark as great King’s-Edgehill students. 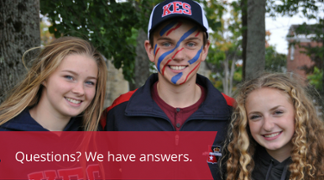 Our team will play against other Prep Level teams in Canada, and KES has become an Associate Member of the New England Preparatory School Athletic Council (NEPSAC), which is the most prestigious school athletic conference in the United States. Our Prep Team will spend most of the winter months playing games in New England, and we even have a Christmas Break trip to Phoenix, Arizona, to compete with some of the best teams in North America! I have a very clear goal of building a World Class level, global destination programme for Girls Elite Basketball here at King’s-Edgehill School. On the court, the preseason just wrapped up, with some outstanding play by our team. A unique schedule provided our girls with the opportunity to play College and University teams for their first 4 games. The inaugural game for our programme took place in Charlottetown, PEI, against Holland College, a top 15 nationally ranked College programme. Our team and coaching staff were extremely nervous prior to the game, and it took a bit for everyone to “settle in”. The first bit of history for the programme happened when Claire Englehutt made a beautiful textbook post move to score the first points in our programme’s history. The older Holland College team showed our high school-age team how things are done at the next level and jumped out to a 21 point lead early in the 2nd quarter. Before too long, our KES girls started to get into a groove, shed the nervousness and started to chip away at the big lead. By halftime, the lead was down to 12 points, and momentum was clearly in favour of the team wearing the Red and Navy! The 3rd quarter really showed how good our team can be, as KES outscored the Hurricane 30-17, to take a 54-53 lead into the final quarter. The battle continued, with KES taking its largest lead of 4 with 5:33 left in the game. The game came down to our possession of the ball out of bounds, 6 seconds to play, and the score tied 72-72. Unfortunately, the ball was tipped and our effort to execute the play was thwarted by some aggressive defending by Holland College, forcing the game into overtime! During the extra period, the experience of an older Holland team managed to pull away and the game ended 87-78 for Holland. Our second day of competition had us playing one of the best teams in the Atlantic Colleges Athletic Association (ACAA) and a team that ended 2017-18 ranked 6th in Canada. To play a ‘favorite to win their conference and return to Nationals’ seemed like a large challenge for our young team. This day was very different than our first game a day before. The girls played calm and collected, with a real attention to execution in the 1st quarter. Aaliyah Arab-Smith led us out to a 17-14 lead by the end of the quarter. Savannah Provo took the reins in the 2nd quarter with 10 points, and the rotation of players through our roster started paying dividends, and KES led at halftime 36-24. After the break, our girls came out on fire, and pushed their lead over last years’ ACAA Conference Champions to 20 points half way through the 3rd quarter, something the entire crowd of parents and fans of both teams were all trying to comprehend. Rachel Higgins was on fire in the 3rd, knocking down a trio of 3 pointers (9 points) in a stretch of 5 consecutive offensive possessions, and Mackenzie Smith chipped in with 6 points in the period and inspired play overall. The quarter ended up with KES leading Mount Allison 54 – 35. The 4th quarter became very exciting, as the experience of the college players helped them claw their way back into the game. 2017-18 ACAA Player of the Year/2017-18 MtA Female Athlete of the Year, Kiresten Mangold, started to assert herself, but our girls had enough to contain her with group defence and teamwork. The game evolved in a tight affair, with KES up 4, with 14 seconds left in the game, MtA had the ball. Our girls dug in, and held on to their lead, and upset a national college power 64-60 for our first win in programme history! The following week, our Prep Team had a scrimmage with the Dalhousie Tigers Women’s Team. Dalhousie had heard the news that our girls were a competitive talented side, and were ready to play from the first tip. The KES side fought very hard, but fell short in their effort, and had a valuable learning day, the type of day coaches use to remind young players of how hard you have to work to be successful on the court, and especially if you have dreams of playing basketball at the University level. A 62-36 loss had our KES crew resetting their outlook, and preparing them to work towards higher standards across the board. We finished the pre-season with a trip to Antigonish to play the St Francis Xavier X-Women. This trip was tough, as some nagging injuries flared up, and only 8 healthy bodies were available for this matchup, but that didn’t deter our KES Girls from jumping out to a 14-4 lead after the first quarter. The X-Women turned up the pressure in the 2nd quarter, but KES went to the halftime break with the lead 30-25. The game remained competitive, with Co-Captain Aaliyah Arab-Smith and Antigonish native, Briar MacDonald, leading our crew to keeping a slim 49-47 lead after 3 quarters. The hard work and tough play by all of our short-handed crew started to take its toll, and the 4th quarter turned in the X- Women’s favour, and the University team took a 71-60 win over KES. I can’t say enough about how talented and hardworking these young student athletes are. Some of the performances by the girls would have led statistical categories nationally at the College level and University Coaches from across Canada are already calling wanting to recruit our girls to their University basketball programmes after they graduate from King’s-Edgehill. Wherever we have travelled, and many of the people we have interacted with have commented on how well the girls represent King’s-Edgehill School, and they are looking forward to coming and visiting our campus in the near future, and taking in a home game. Please click here to check out our website and our game schedule. Come out and cheer on our new Elite Girls’ Prep Basketball Programme!! Does King's-Edgehill School have a gymnasium, a swimming pool, a library, Music room, theatre, or art centre? Get answers to these and many other common questions in our ebook, Questions to Ask.